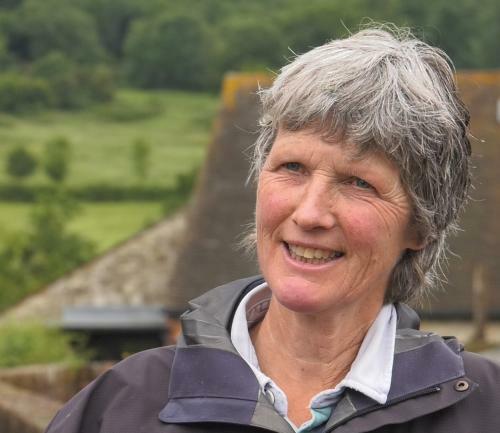 Farmer Fidelity Weston, together with her family, runs 175 acre Romshed Farm near Sevenoaks in Kent. She is a new Country Trust farm host and although began organising farm visits about 5 years ago, 2016 marks her first year organising them through The Country Trust. Fidelity tells us in her own words about why she supports the charity. "I was particularly interested in children from city schools coming to visit our farm in order to give them the opportunity to experience the countryside first hand and allow them an insight into the way a working farm is run. Working with The Country Trust, I have focused on introducing schools to the animals on the farm in order to teach children where their food comes from. Romshed Farm is a real working farm and I’m very keen to try to get the children as near as possible to the animals, giving them an opportunity to stroke the pigs, walk through fields of sheep and get close to the cows and calves. I also like to ensure children have wider wildlife experiences too, ensuring it relates to their lives in London. Some of the visits this year have been at bluebell time, so we have taken children on walks in a bluebell wood and talked about how the woodland flowers are at their best in the spring, when there is more sunlight. We look under logs and introduce the children to Detritivores – the world`s best recyclers who turn dead leaves and wood into soil and keep the woodland cycle going. The children usually seem a lot more relaxed and at home as a visit progresses and it is good to see them get used to farm life and the animals. They ask great questions – one of the most interesting being “Do you kill the animals before you eat them?”! At the end of the last visit, one of the girls told me she wanted to be a farmer when she grows up, which was fantastic to hear. I always enjoy the visits and it is particularly interesting to learn how much the children do and do not know about country life. Some of their observations really help me appreciate things that I’d normally take for granted, such as mud in gateways and the smell of the animals! The schools we have had from the Country Trust have been really delightful – appreciative and interested. I have had a long experience of educational visits and like to have close contact with the teachers and schools beforehand. It is always helpful to have another pair of hands, particularly when faced with unexpected difficulties, so knowing I have support from Country Trust staff on the day is invaluable. I feel that visits to Romshed Farm really open children’s eyes to a way of life that is very different from their own but one that they could get involved in if they want to when they’re older. We try to encourage children to think a little bit about where their food comes from, which is increasingly one of the most important issues in life and the current lack of understanding is enormous. I therefore believe Country Trust farm visits help to break down some of those barriers a tiny bit."